A Lenten Cleaning Day in St Hilary's! 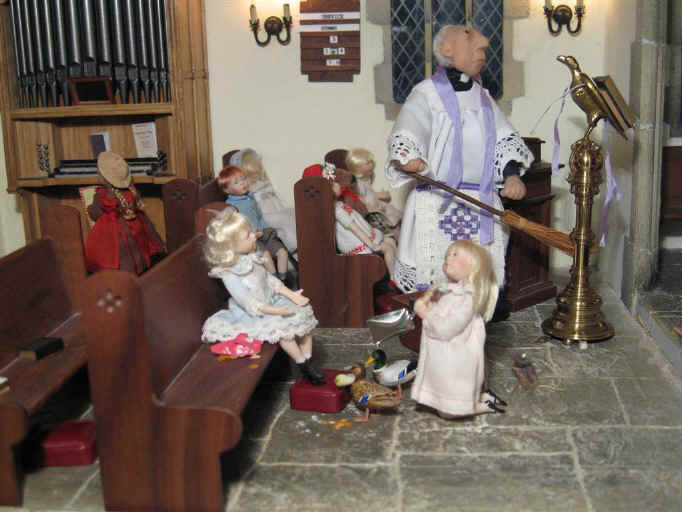 St Hilary's vicar, the Reverend Gyles Ponsenby Smyth, has decided that, as the church is entering the season of Lent, when Jesus fasted for forty days and forty nights, he would arrange for the church to have a full Spring clean! 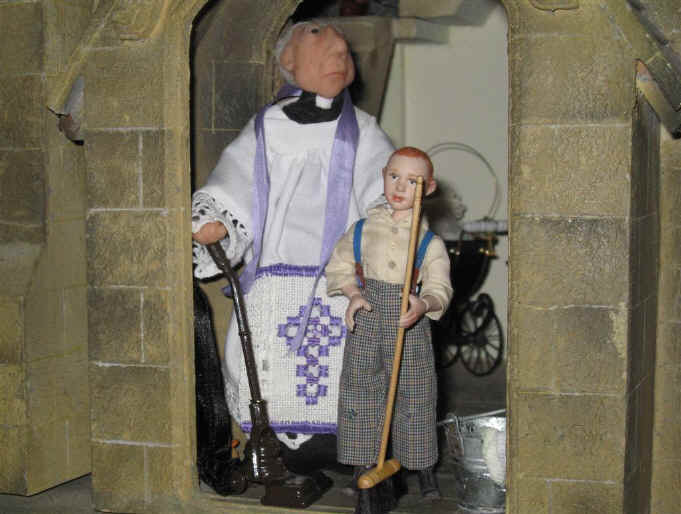 Have you noticed the special cleaning pinny that the vicar has got on? 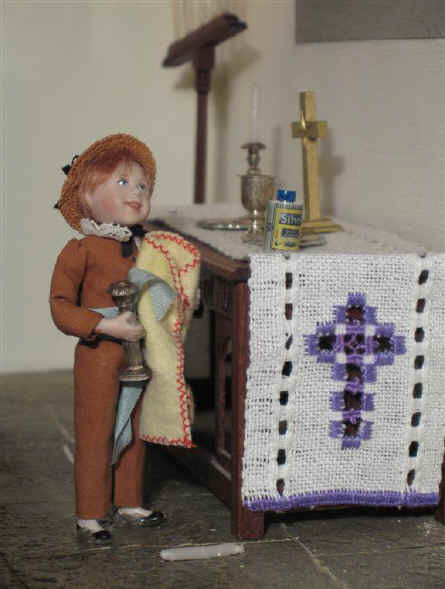 It has the same cross as the altar cloth because he always wears it when they clean the church. Cleaning the church always reminds him of this time during Lent when everybody has a kind of "spiritual cleaning" when they remember the time Jesus fasted for forty days and nights in the wilderness! The colour purple, in the church, is used to represent penitence. Lent is called a penitential season. 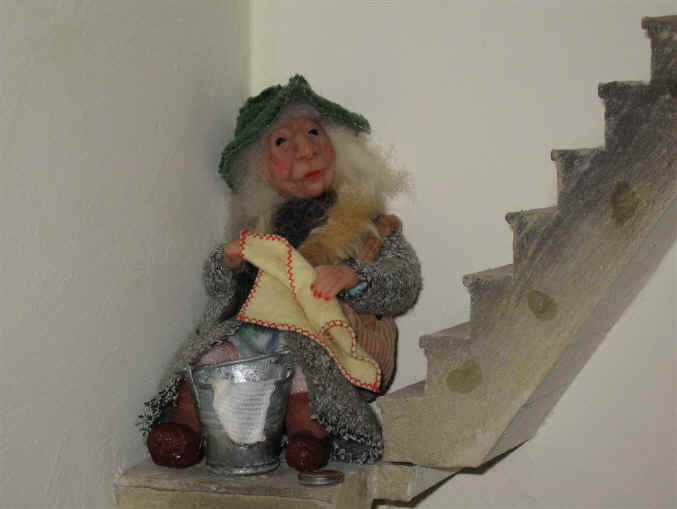 Ambrose agreed to help the vicar and bring some cleaning materials and implements for the church Spring clean. Even Rita has decided to lend a hand - even though she is having to be careful NOT to damage her lovely nails that she has recently painted with red nail varnish! Homer has offered to help out with some of the cleaning too! Here he is lending a hand to Priscilla Jane as she cleans the entrance to St. Hilary's church. Homer has made sure that he has brought his fruit flavoured mineral water with him! He knows he will need a long drink after all of this work! Priscilla Jane and Adele were asked to give the new pipe organ a good dust and polish! The children had to move the heavy stool out of the way because Priscilla Jane noticed how dusty the foot pedals were. She enjoys giving them good dusting as Adele makes sure that the keyboards also get a good clean with a nice clean duster. Oh dear! What have we here? Emily has been caught red handed snacking in church again! Can you see that she has managed to eat...........a chocolate bar..........orange AND apple! Who else is helping too? 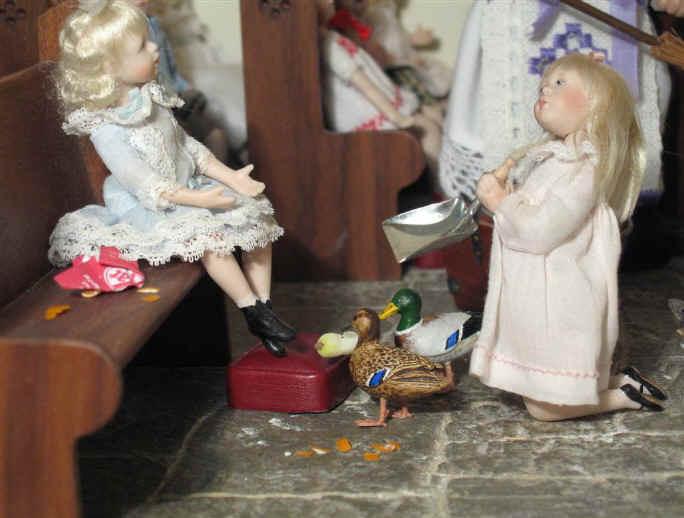 It is Esme and Ernest, the pair of ducks who live nearby in the local village pond. Esme, like Prisiclla Jane, was quite disgusted with Emily for eating an apple and then discarding the apple core on the floor. Esme has picked the apple core up and is going to give it to Priscilla Jane to throw away in the church bin. Ben is VERY privileged because the vicar has agreed to allow him into the sanctuary in order to clean the silver candle sticks on the altar. Ben thinks he is doing really well..........but WHAT is on the floor Ben? It is the candle that belongs in the candlestick he is currently cleaning. We hope Ben notices soon and puts it back in the candlestick when he has finished cleaning it. Haven't the children done well?! 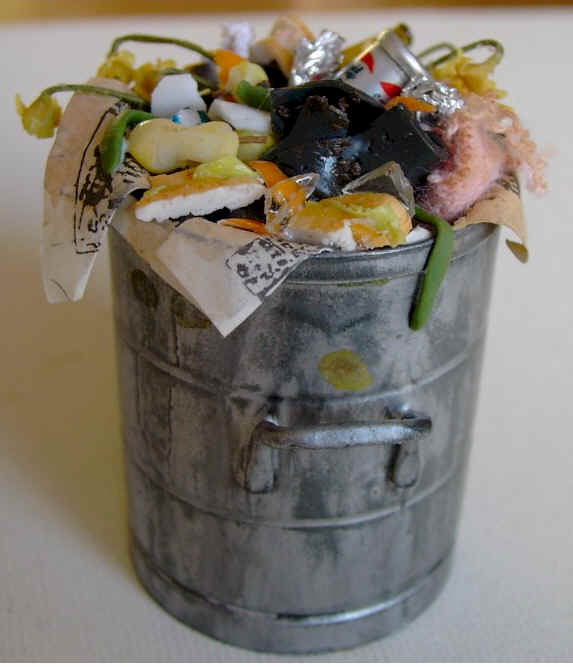 The bin is now over flowing with all the rubbish that the children and the vicar have found as they cleaned the church. A fish skin left over from some fish the children have fed the cat. The cat is VERY fussy and hates fish skin! An old broken boot that even Homer could no longer wear! Some broken mineral water bottles that Homer had forgotten to throw away after one of his church snacks. Some dying daffodils left over from one of the church flower arrangements. They had slid under a pew and were forgotten until they were found on this cleaning day!